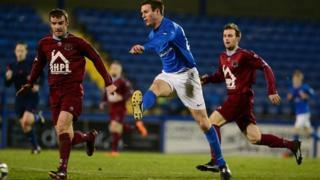 Gary Hamilton's 85th-minute equaliser rescues a point for Glenavon at home to Institute in the Irish Premiership. The north-west club had taken the lead early in the second half through a Stephen O'Flynn free-kick. Glenavon had James Singleton but the 10 men picked up a point when Hamilton came on as a substitute and scored five minutes from time.